In 1832, Bowie was elected a commander of a citizen militia, with the rank of colonel to keep the peace and protect the colonists from attacks by hostile Indians. During this time, he would be in a number of confrontations. 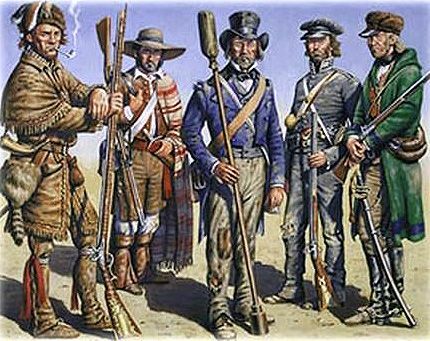 This militia group would later become known as the Texas Rangers. In September 1833, Maria Ursula Bowie and their children, her parents, and her brother were visiting Monclova, Mexico, which had become the new capitol of the Texas colony. Between September 6 and September 14, all of them would die of cholera. At that time, James Bowie was in Natchez, Mississippi and was ill with yellow fever. He would not find out about the deaths until November. Afterward, he began to drink heavily. The next year he returned to land speculation and was appointed a land commissioner, tasked with promoting settlement. His appointment ended in May 1835 when President Antonio López de Santa Anna abolished the Texas government. At about this same time, Texians began agitating for war against President Santa Anna, with Bowie, along with William B. Travis, among the agitators. In late October 1835 an army of men, led by Stephen F. Austin and James Fannin, which included Bowie, marched on San Antonio, where Bowie’s contacts among the population proved extremely helpful. On October 28th, the Battle of Concepción, which occurred on the grounds of Mission Concepción, two miles south of San Antonio, was fought. At that time, the Texian Army was split, with some of them at Concepcion and others encamped outside of San Antonio. When General Martín Perfecto de Cos learned of this, he sent 400 soldiers to attack the Texians camped at Concepción. When the Mexicans attacked at dawn, the Texians took cover in a horseshoe-shaped gully and because of their good defensive position, longer firing range, and better ammunition were able to repel the Mexican soldiers who retreated after three hours of fighting. Mexican losses included 14 killed and 39 wounded, some of whom died later. Texas losses included one killed and one wounded. This was the first major battle of the Texas Revolution. Bowie was hailed as a hero. 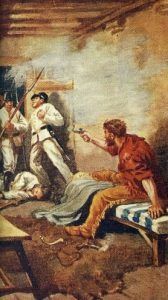 He was also involved in the Grass Fight, on November 26, 1835, which became the last engagement in the Siege of San Antonio. In January 1836 Jim Bowie was in charge of the group of volunteers at the garrison of the Alamo. 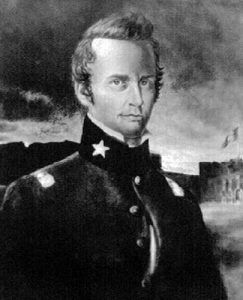 Lieutenant Colonel William Travis arrived in February to take command of the Alamo, bringing with him a group of army troops to bolster the numbers defending the Alamo. There was some tension between the two leaders, however, when famous frontiersman Davy Crockett arrived, he was able to defuse the tension. 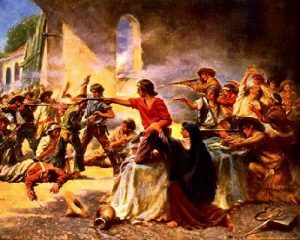 The Mexican Army arrived on February 23, 1836, led by General Santa Anna and began the attack on the Alamo. By that time, Bowie was seriously ill and confined, delirious, to his bed. According to legend, when Travis drew a line in the sand and told the men to cross it if they would stay and fight, Bowie, too weak to walk, asked to be carried over the line. The battle lasted until March 6, 1836, at which time, all the remaining 188 defenders, including James Bowie, Davy Crockett, and William Travis were killed.